Delving into the question of why the region is sprawling out, part the discussion must begin with the historical legacy of housing in our region. The first home (left to right) is the house my dad grew up in. On Byng Rd. south of Tecumseh, it featured 2 bedrooms plus a attic room where 4 kids were raised with 1.5 baths. On the fringe of Windsor in the 1960s (now it is near the geographic centre of the City), the house featured a steep staircase to get into the basement and up to the second floor and 4 steps to get in the front door made the house nearly unworkable for my grandmother prior to her passing. Those same staircases forced a closed layout that didn’t allow for an open concept on the main level and only the decision by my grandparents to blow out the back wall of the house and build a porch did they get access to their backyard. A furnished basement added some additional living space and was home to the extra half bath, unfortunately it was (and I suspect still is) susceptible to flooding. The second house is my home in West Windsor. With no basement and knee-walled upstairs the 1200ish sq ft. are great for my wife and I with our dogs. I would call this a prototypical “starter home” but I’ll be honest, if we were to have kids (or get more dogs), it would be hard to stay here despite being a block from a school. Both my wife and I work at home; she uses the second bedroom as her office while I used the former dinning room. A single bathroom is never ideal when two adults have to be places in the morning. The third home was my mom’s mother house on Janette Ave. Although the largest and oldest of the three houses, it featured only one bathroom and an unfinished basement with a 7 foot ceiling making almost unusable other than storage. Much like my dad’s house stairs played a major role in the design and it was these stairs that forced my grandmother from her home over a fifteen years ago. Although these homes have worked (and continue to work) for families in our community, times and preferences have changed. Compare these older homes to the “needs and wants” of many modern families. A room for every child, on-suite bathrooms, home offices spaces, separate TV rooms, open concept floor plans, energy efficient designs and appliances, a backyard, 2000+ sq ft, a garage, etc. Windsor older housing leave a lot to be desired for a significant portion of the population. Without a doubt there is another segment of the population that these amenities don’t appeal to, but the question that has to be asked is whether they represent a significant enough portion of our community to drive political and economic decision making is another question. The impact of this housing misalignment is partially illustrated in the map below. Taken from home sale data from 2005 and 2015 that was collected as part of the Neighbourhood Market Value Study by the City of Windsor. The map illustrates the price change by equal count categories. When digging through the raw data, of the 379 DAs where data was available, 168 saw the median sale value in a neighbourhood decline over the decade, while another 29 DAs saw their values increase at a rate of less than inflation during that 10 year period (2.45% annually). The geographic concentrations of these swings are at least partially based on the fundamentals of the stock and not cyclical economic factors, especially since this data was snapshot pre/post the recession. More evidence emerges from the Windsor Real Estate Association data from 2014 and 2015. The above shows how different neighbourhoods/communities residential prices changed year over year. As averages there were certainly some outliers and as we know that prices have continued to rise. What is clear is that the greatest growth in housing prices are emerging in areas of the city where the stock is newest. I myself bought by home built in the 1950s in West Windsor for $118,000 in December of 2016. What is important to takeaway is that not every neighbourhood is valued equally which many advocates in our community fail to account for and is largely the reason why developers have avoided building in the core without subsidies. Looking at home buyer preferences and matching them to Windsor’s housing market a general disconnect becomes clear. Although there are plenty of denser designed single family homes in Windsor’s core, unfortunately many of them are older, smaller and misaligned with modern tastes in housing which would require expensive renovation. Examining millennial housing preferences (other sources: here, here ) outside of walkable neighbourhoods and/or transit density they want things in a home that many houses in the city’s core don’t easily provide. Of course affordability is important but given that Essex County is one of the most affordable regions in Canada that point is of less importance than in the GTA or Vancouver. As a result millennials are looking for turn key, low upkeep, energy efficient, technology enabled, homes with open floor plans, modern appliances and home office spaces for their side hustle. When I think of downtown housing, although pieces of this are present in particular houses, they are not present at scale. Shifting demographics to seniors, looking at best practices in senior housing design, existing housing stock in Windsor’s core fails to meet many standards. My aforementioned grandmother had to leave her home due to not being able to climb the stairs to enter/exit her house while her laundry and chest freezer were largely out of reach. Doorways not wide enough for walkers or wheel chairs, non-accessible showers or bathtubs, lack of main floor laundry and a desire for a low/no maintenance dwelling much of the housing in the core of Windsor fail to meet these best practices and desires. Generally seniors like millennials are looking for turn key accommodations not moving into a downsized home that then needs tens of thousand of renovations. Research out of CMHC from BC point to another key point, downsizing seniors still want space. For their “future home” 73% of seniors want a 2 bedroom or larger home, 34% identifying a single family home as their ideal dwelling followed by apartments/condos at 27%. Although from a different province the survey was a statistically significant sample and when I look at these numbers I see the new builds of ranch style homes in LaSalle or Lakeshore as being more compatible to these desires than a 20+ year old home in Windsor’s core. The City of Windsor Market Value study pointed out that in portions of the city, developers simply couldn’t make a profit, this is was justification for the reduction of development charges in core areas of the City and the implementation of the Downtown CIP. The result of that lack of profit making ability we saw an outward push in development as new greenfield homes do turn a profit. Data from the Canada Mortgage and Housing Corporation shows suburban County is out stripping the City in new home construction. Following Jan 2018, CMHC changing how they reported this data (because I can’t have nice things), from Jan to Oct 2018, the City of Windsor saw another 287 new units started, while the rest of the CMA saw 487 units. Unfortunately I haven’t be able to find a comparable breakdown of how these units are allocated as they become available only after a year is completed. It does appear that there is some shift in the style of housing towards semi-detached town homes, but they are still being built, at scale on greenfield sites. Greenfield construction seems to be here to stay based on this data and even without including the Sandwich South Development Lands, the rest of the CMA has lands for thousands, if not tens of thousands of new homes. LaSalle’s (now former) mayor stated on Windsor Morning the town plans for 50,000 people north of Laurier parkway; new sewers have been approved in Amherstburg to “spur development”; Tecumseh suspending fees on certain development and the Town of Essex investing in Harrowby removing development charges. This outward construction has not helped the rental situation in the City of Windsor. When looking at the ratio of household ownership to rental by ward you see clear patterns. Concentration of rental households in core also impacts that overall housing market. From a profit standpoint it is both cheaper and easier to build homes for sale than apartments for rent. At the same time there is a strong correlation (0.64) between renters and low income prevalence within the city. This does help paint some of the implicate outcomes of research on rental properties impacts on housing values (another here) that shows correlations with overall property values of a neighbourhood depending on the concentration, state and form of the rental housing. Hence the battles between NIMBY homeowners against density and rental/affordable development. Even if those battles aren’t apparent (here as well) in our region they are baked into the process through which housing developers decide to build, they take the path of least resistance. The census provides us another view of our regions development patterns. The following table shows the change in occupied housing type between the 2016 and 2011 census for each municipality and the Wards of Windsor. Definitions of the housing type can be found here. Ward 7, 9 and 10 are all home to large sections of development lands which is targeted for suburban development in the City of Windsor but these development levels pale in comparison to the nearby LaSalle and Lakeshore for single detached homes. The decline in single detached homes in Ward 2-4, I would suspect result from both the conversion of homes into rental properties and rooming housing, and the removal of some blighted properties. So why are things happening this way? Fundamentally the City’s core is largely landlocked. Although there is plenty of vacant land, very little of it is connected in a manner that allows it to be assembled to build a subdivision that allow economies of scale. Generally a developer doesn’t want to build one or two houses, they want to build twenty or thirty as that is where there are increased profit margins. In addition, as much of the available land is some form of brownfield or has a vacant buildings already on it, the cost of that remediation for many lots in the core must be factored into the developers mind. Despite there possibly being a latent desire for additional urban options in housing, broader statistics show that existing housing stock in Windsor is misaligned to the desires of many demographic groups. The recent CIP fueled announcements for the downtown core do offer promise new development but they still need to provide perceived value. One of the larger projects a 16 story, 120 unit building has been proposed downtown and supported through the CIP isn’t a done deal and still faces some hurdles in my opinion. The above numbers are an estimate based on publicly available information and they assume no profit making, construction delays, added costs or revenue to cover future maintenance. These numbers also don’t include the potential benefit of the subsidies offered by the City. Although very basic in its assumptions with the per unit cost being over $90 per month more then the average rental rate in Ward 3 before the owner makes his money back. The question becomes who lives here? If these units come in a $900+ per month or are selling as condos for $275,000 or $300,000 are existing residents able to afford that? At that price point and a few hundred dollars more in monthly payments, you could own a home and live the suburban dream instead of rent. The price you would pay is having to put up with one of the shortest commutes in the country to get to and from where you need to be. My house in West Windsor, certainly has appreciated in value in the past couple of years that I have owned it. In that time I’ve spent about between $8,000 and $10,000 in renovation and repairs despite doing a number of these projects myself. The simple fact that older homes require more work to maintain is a factor that may be driving people away from Windsor’s core. The structural challenge of Windsor’s housing stock is one of the biggest barriers facing our city. This aged and misaligned housing stock has contributed to a segmentation of the housing market and the populations that live in neighbourhoods. At the same time, home ownership remains an aspiration for many in Windsor. Issues of poverty, asset inequality and access to services will only be solved when this housing asymmetry is tackled. Developers won’t build homes in the core without subsidy due to a lack of economies of scale and profit potential. They won’t build apartments in outer areas of the city due to the political risks. This creates incentives to perpetuates existing development patterns that exacerbates the structural challenges that Windsor’s housing stock faces as that is what enables them to make a living. For those looking for denser more urban Windsor, the problem you must solve is how to redevelop the existing housing stock and neighbourhoods without displacing vulnerable populations. A bike lane, a new tech business setting up shop or anchor institution opening its door aren’t enough to solve these problems in my opinion. Whole scale neighbourhood redevelopment maybe needed in many cases. So the question becomes how do you physically rebuild housing in a community and empower those who live there and more importantly who pays for it? A tweet by former Councilor Bill Marra caught my attention. As I responded when I retweeted his tweet, LRT should be considered but it needs to be done in the context of other possible corridor options like BRT, a street car or as a part of an traditional corridor with enhanced bus service and active transit options. Although their is no doubt that an LRT running down University Ave knitting together Sandwich Town, the University, the Downtown would be game changing city building initiative there are some challenges. The first is whether such a rail line would be viable from a usage standpoint. Now there is no doubt that if built some riders would use it, particularly students shifting between University campuses but there is a real question of if there are enough people in Windsor’s downtown to support route. Currently on Toronto, Edmonton, Calgary and Ottawa are home to LRT lines in Canada, with Waterloo Region, Surrey BC, Gatineau Que, Peel Region and Hamilton having them in the works. A rule of thumb with LRT, regardless of whether it is elevated/separated with their own right of way (think Eglinton LRT in Toronto that is under construction) or embedded in traffic (Q-line in Detroit) you need approximately 10,000 people per square km along the line. Although other research point lower thresholds, it then requires employment density along or at terminus of the line and entry points that captures ridership from other parts of the community. Unfortunately Windsor fails to meet this this population threshold, with the City’s population density being only about 1,400 people square km. From the Census DAs along the University Avenue corridor we find a density of 3,992 people per square km and after removing the University and a few other lower density DAs (around the bridge and waterfront) it only increases the density to 4,348 people per square km. Although there is no doubt that an LRT would attract investment and intensification if we have double the population density in established neighbourhoods or transform where people do business in or city to potentially make it viable the question becomes, is it worth the cost? 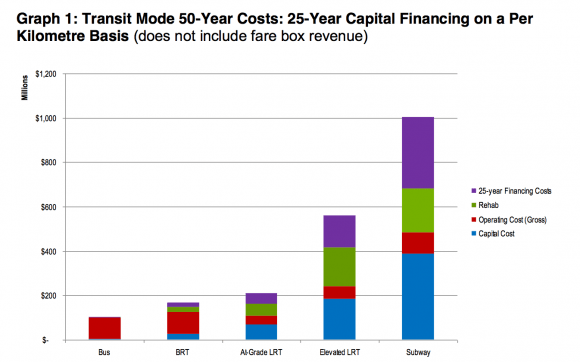 The chart below illustrates the different lifetime cost structures of modes of public transit on a per km basis (Boring Company not included). There are several things to consider when looking at the chart above. Obviously initial capital outlay is important and in all likelihood, at least partially paid for by other levels of government. A similar statement could be made for the rehab costs as precedent is in place where upper level of government assist in long term capital revitalization. One the flip side, operating costs are almost complete bore by the local transit entity along with the financing costs for local portion of the capital and rehab costs. At just under 5 km from Mackenzie Hall to past Caesars on University Ave. the potential costs of transit in their corridor become very real. London opted for a BRT (now itself in doubt) over an LRT largely due to the cost, construction time and questions about viability due to population density. Waterloo has gotten its LRT helping it cement its tech friendly image but it is $50 million over budget and months behind schedule. Hamilton and Peel Region are both pushing forward with Metrolinx LRT plans which have the potential of including community benefit packages to their impacted neighbourhoods. All options should be explored for the regeneration of the University Ave corridor but when we get down to brass tacks, certain options are more viable and reasonable. Personally as the trade offs between one option and other could result in millions of dollars in additional lifetime costs. Those dollars maybe better utilized dealing with other quality of life issue or combating some of the social issues that exist in the same neighbourhoods as this study. Although I think an LRT is impractical for Windsor, all I can do is echo’s former Councilor Marra’s comment to get involved and dream big. The online survey can be found here. The Excel file below holds a record of all recorded votes by Windsor City Council from January 1 2015 to September 17, 2018. All of this data was mined from City Council Minutes that are posted on the City of Windsor website. The file is sorted into sheets by year and tracks Yay, Nay, Abstain or Absent votes. In Columns O and P you have basic counts of the number of “Yay” and “Nay” on a particular item. Minutes do capture NAY votes on non recorded votes. These votes are included in this document, it is not clear if all other Councillors voted in favour, abstained or were absent for these votes and should not be interpreted as such and cells for non “Nay” voters are left empty. Motion/votes related to In Camera items that are taken in Council are not captured. Votes on Committee items are not full captured ex. items/minutes from committees end up in some council minutes, within those minutes/item are additional votes and results are included. As some agenda items are several paragraphs in length, I only captured the item number and initial description. Please refer to the specific Council minutes for full description of the motion/measure/decision. The Town of Lasalle doesn’t have Wards, so I divided the community into 4 areas based on Census Dissemination geographies. The following table “Wards” show the LaSalle total plus the socio-economic breakdown of the 4 areas. Note: there was little significant variation (+/-1%) in employment by the divisions that I applied to LaSalle. Although I find much of the work of Kunstler extreme in its descriptions and consequences, the comments that he made about Windsor do hold some water. Windsor major arteries are ugly and a significant challenge to overcome from a safety, aesthetic and environmental standpoint. Arguably the city is defined by six major North-South (Huron Church, Ouellette/Dougall, Howard, Walker, Lauzon and Banwell) thoroughfares, three major East-West (Tecumseh, Wyandotte and Riverside) corridors and EC Row Expressway. You can argue that CR 42/Cabana Rd could also join this list but given the geographic location and that large areas are currently not developed it is one to watch for the future. These are the arteries through which the lifeblood of the city flows. Although some would argue the purposes of these roads, what they should be for, for the most part these roads were built for the car and designed to satisfying a community and region built on sprawl. The only major artery that “fits” a “main-street design” would be sections of Wyandotte St. (in Walkerville and near the University) and it could be argued that elements are missing from those areas (protected/separated bike lanes as an example). The road diet on Riverside Dr. did offer what a temporary glimpse of what the streets could be but there is a bigger disconnect not only in the road designs themselves but in the building stock that sits next to them. So what did I do? I counted buildings along Tecumseh Rd from Huron Church to Lauzon and Walker Rd from Provincial to Riverside Dr. This evaluation of the building stock isn’t scientific but it does illustrate the nature of the problem. Buildings were classified in one of eight categories: residential (single and multi); commercial (single or multi business); mixed use (ground flood commercial with apartments above); institutional, parking/lots and abandon/vacant. To try and transform these arteries into something other than race tracks the building stock must be changed. It is true that road diets, bike lanes, traffic calming would help, but without places to go, buildings that are adapted to roles other than servicing cars or people living on these roads, the purpose of these throughfares won’t change which reinforces the current status quo. Given that only about 16% of the buildings on Tecumseh Rd (2% on Walker Rd) feature some sort of mixed commercial/residential usage, the question becomes where are the people and places to slow down these street? This lack of mixed usage is compounded by vacant lots, car lots, standalone parking lots which contribute to 15% and 24% of respective “building spaces” on Tecumseh and Walker Rd. The bulk of establishments (greater than 55%) on both Tecumseh and Walker Roads are are non-mixed use commercial, the vast majority of those being single story construction. Beyond Walker and Tecumseh Roads; almost every other major thoroughfare in the city all face similar stock challenges. With large stretches of poorly aligned building stock low density residential; overbuilt car centric commercial segregated by swaths of industrial properties both active and brownfield. Although not all portions of the major arteries in Windsor are designed to be dense mixed use construction, there is almost no evidence beyond a few condo developments on Wyandotte St. that redevelopment is a priority for developers. I would surmise that part of this lack of interest has to do with many of these arteries being lined with vacant commercial spaces and brownfields that are difficult and expensive to re-purpose. Yes surrounding neighbourhoods have people, but if they aren’t going to places on these roads now and business aren’t utilizing the existing vacant land or commercial spaces, will just having more/different abilities to access these spaces transform these areas or is something more drastic in order? Arguably Wyandotte St. is the closest major thoroughfare to a “main street” with the BIA areas (plus Wyandotte West near the University) being the clusters of attraction and activity to emulate. These BIAs are built around mixed sub-communities along the artery and are currently missing some connective tissue to tie them together, separated bike lanes as an example. I would argue that this is a model that could to be emulated on sections of other major thoroughfares and although not all of the roads are conducive to this change something probably needs to be done. What is needed is a building stock that is conducive to mixed activities and that is missing on most thoroughfares. Although I doubt the Costco plaza of South Windsor on Walker to be a main street, but why can’t the markets near Ottawa Street be connected to a future development at the GM site by one? To bring a “main street” to these arteries is a monumental challenge that as long as the existing building stock is maintained, no amount of road diets, bike lanes or tree plantings will solve the underlying issues. As these roads are the skeleton that the rest of Windsor is built on, what needs to be done is a radical transformation of the housing and building stock in core areas of our community. Without change these roads are barriers to connectivity that segregate and isolate parts of our community from one another, the car will remain king, infill will remain illusive and sprawl will perpetuate.